Worried about raunchy late-night chat sessions or emails with credit card details coming back to haunt you? A new system developed by researchers at the University of Washington in Seattle allows digital communications to simply self-destruct after a set period. 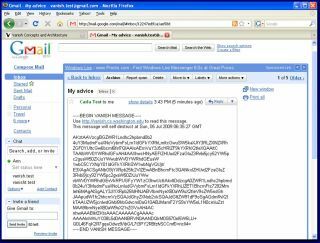 The technology, called Vanish, works with e-mail, Facebook posts and chat messages composed in Firefox. The Vanish prototype automatically washes away data using the natural churn on file-sharing networks. For each message that it sends, Vanish creates a secret key, which it never reveals to the user, and then encrypts the message with that key. It then divides the key into dozens of pieces and sprinkles those pieces on random computers belonging to peer-to-peer networks. The file-sharing system constantly changes as computers join or leave the network, meaning that over time parts of the key become permanently inaccessible. Once enough key parts are lost, the original message can no longer be deciphered. In the current Vanish prototype, the network's computers purge their memories every eight hours, although an option on Vanish lets users keep their data for any multiple of eight hours. Vanish makes information irretrievable from all websites, inboxes, outboxes, backup sites and home computers. Not even the sender could retrieve it. "A major advantage of Vanish is that users don't need to trust us, or any service that we provide, to protect or delete the data," said researcher Roxana Geambasu. She compares using Vanish to writing a message in the sand at low tide, where it can be read for only a few hours before the tide comes in and washes it away. Vanish was released today as a free, open-source tool that works with the Firefox browser. To work, both the sender and the recipient must have installed the tool. The sender highlights any sensitive text entered into the browser and presses the Vanish button. That text can be read when the recipient highlights the text and presses the Vanish button to unscramble it. After eight hours the message will be impossible to unscramble and will remain gibberish forever. Vanish works with any text entered into Firefox, from Hotmail, Yahoo and Gmail, to web chat and social networking sites MySpace and Facebook. The Vanish prototype works only for text, but researchers said the same technique could work for any type of data, such as digital photos.